Tracking parcels sent via Yodel is easy to do online and simply requires the Yodel parcel number, which can be entered on Yodel Direct, MyYodel or YODEL Tracking, depending on the service that has been used and the type of client that has sent the package. Tracking information is detailed and gives in depth information about specific dates and times of delivery, along with the precise location of the package and its delivery driver where possible. 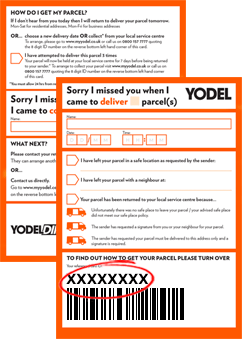 Customers will be able to see whether their parcel has been received at one of the Yodel Service Centres, whether it is currently out with a driver for delivery, or whether it has already been delivered to the recipient. Business clients who send consignments through Yodel can make use of their special YODEL Tracking Web Tracking service, whereby packages can be tracked individually by parcel number, and where consignments are traceable as an entirety through entering the consignment number. This makes tracking consignments containing multiple parcels quick, easy and convenient, saving time manually entering each individual number. Tracking 2 day, next day and Yodel World Economy packages can be done via Yodel Direct, where the Yodel parcel number must be entered. To track and manage any kind of Yodel delivery with a parcel reference that is 8, 13 or 16 digits in length or begins with the letters JD, MyYodel can be used. Yodel World Economy travels usually 3 to 5 days, which means that you can consider it to arrive within 72 or 120 hours, where most shipments should be delivered within 72h. The shipment of Yodel World Economy can be tracked anytime in the time it is on its ways as well as after it arrived. If the parcel reference begins with the letters (J) JD, customers should disregard the first (J) when putting the parcel reference into the “Track Your Parcel” option that can be found throughout the website, instead inputting as JD00, followed by the remaining numbers. Yodel came about after the acquisition of the UK division of DHL, the former logistics company that had a large customer base consisting primarily of businesses and was widely regarded in the commercial sector. What consumers now know as ‘Yodel’ was officially launched in May 2010, when investors confirmed the UK DHL’s re-branding. Despite the acquisition of the UK brand, DHL Express still exists outside of the UK and is stronger than ever. Home Delivery Network acquired DHL’s domestic parcel division in the UK and had a long and complicated history before eventually becoming Yodel, initially operating as Shop Direct Group’s logistics division until the two companies de-merged, becoming independent, in 2008. In August 2013, the company formally changed its business name to Yodel Delivery Network Limited from Home Delivery Network Limited. 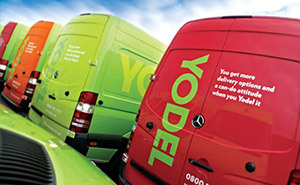 Yodel is one of the most controversial names within logistics and has become somewhat notorious in the UK after a number of instances of negative publicity from press such as the Daily Mail and Watchdog, who, between 2011-2012, highlighted the companies poor performance and the level of customer dissatisfaction that followed. Yodel responded to the criticism, stating that they were not equipped or prepared to deal with a sudden and unexpected surge in demand. Despite this press damaging its reputation and giving the company a rocky start, it has not put clients nor customers off using their services, and they have nonetheless thrived. Its client base currently totals 1,500, with in excess of 135 million parcels being handled by the company each year. It is the second biggest parcel delivery service in the UK after Royal Mail, accounting for around a quarter of the UK’s home delivery market share. The company has an annual turnover of £650 million. Despite this, the company has recorded a series of annual losses. At the end of June 2013, it recorded a pre-taxation £98.2m loss on activities, a 46% increase on the previous year loss of £66.9m in 2011/2012. Its turnover in 2013 totalled £389m, significantly less than the 2012 figure of £539.9m. Yodel have several sponsoring projects, including a partnership with one of the world’s biggest sporting events, The Tour of Britain, which it has committed to sponsoring for the next five years. As part of the sponsorship deal, the company provides its vehicles to transport cycling equipment and support the race infrastructure, with a fleet totalling around 30 Yodel vans in tow. It also has a sponsorship deal with Friends Life Women’s Tour, the first women’s cycling race of its kind, where it again supports the teams by sending out a fleet of vehicles loaded with all the necessary equipment. As well as being heavily involved in cycling events, Yodel has been a leading sponsor of World Book Night, an event ran by volunteers with the aim of encouraging more people to read, for which it distributes books to over two thousand libraries and bookshops taking part in the event. Yodel does not have an online shop, however its services can be purchased and paid for online through their Yodel Direct website. Orders for collection and delivery are placeable by entering the full details of the package(s), including its height, length, width, weight and an indication of its precise contents. The website takes Visa, Mastercard, Visa Electron, Solo and Maestro card payments, along with the option to pay instantly by Paypal. Yodel are not transparent about their prices, preferring to deal with customers and businesses especially on a one to one basis, providing them a tailor made and priced service, however it is possible to get a general idea, and quotes are available through the Yodel Direct website. Parcel delivery starts at different prices depending on the service selected, and prices will change according to the parcel dimensions, weight and location it is being collected from and delivered to. Included in the price of Yodel services is insurance coverage of up to £20. For items that are over this value, customers can choose to buy additional insurance at an extra cost. The insurance limit on any one parcel is £2,500. By entering the correct value of the package when placing an order with Yodel, customers can see how much it would cost to cover it for the full value amount. For example, to insure a package worth £35 for its full value, Yodel charge £0.75p plus VAT. One cost that must be noted is their fuel surcharge, which is priced according to the latest national diesel prices. Fuel surcharges are standard across courier services. Unlike many courier services, Yodel do not have a depot finder, nor do they provide a comprehensive list of depots with full address details and contact information. Typically, customers will be given details of their local depot when a card is left by a driver in cases where delivery is attempted and nobody is in to sign for the package. This will include precise address, opening hours and a telephone number for contact. Yodel currently has in excess of 60 depots all over the United Kingdom, and is constantly adding new centres due to customer demand and expansion. One of its most recent new centre openings was the Basildon, Essex permanent service centre located on the Burnt Mills Industrial Estate. The large 50,000 sq ft centre caters for 70 van drivers, who receive support from over 50 office and warehouse staff. Other centres which have undergone refurbishment and expansion include Hadleigh Road Industrial Estate, Ipswich, and the Aberdeen site which has been expanded to the Alterns Industrial Estate in Torry adjacent. Individual customers or business clients that have multiple packages or consignments that need to be collected and delivered via Yodel can book their collection on Yodel Direct, a website made specifically for multiple collections. An account is needed to start the booking process, and once the details have been submitted, a label is provided which must be printed and affixed the parcels, ready for the driver to collect. A collection date can be specified at the client and recipient’s convenience, and orders for next working day collection can be placed as late as 10pm the previous day. Once on the Yodel Direct site, an approximate quote for any packages can be obtained, allowing customers to compare prices with other delivery services before going further with the order. All that is needed is the weight and dimensions of the package, along with the collection address and delivery address. There is also a bulk shipping tool to save time and hassle when sending more than one package at a time, an especially useful tool for businesses sending parcels en mass. There are four delivery options on Yodel Direct: Yodel 48 (collection and delivery within 2 days from within UK mainland postcodes), Yodel 24 (next day delivery from within UK mainland postcodes), Yodel Northern Ireland (collection from a UK postcode and delivery to an address within Northern Island in 2-3 days), and Yodel Highlands & Islands (collection from a UK postcode and delivery to a postcode within Highlands and Islands with no time guarantee), and prices for each are clearly shown before selecting to book. Orders made on Yodel Direct are processed by Parcel2Go.com Limited on their behalf. Yodel Direct has a refund policy setting out cases where the customer is eligible for a refund on any services purchased, the terms and conditions relating to this and any potential exemptions. If they fail to fulfil the service as specified in the services description, the customer can file a claim by emailing their reference number and the tracking number of the parcel to refunds@yodeldirect.co.uk within 28 days of the order date. For more information you can visit here. One of Yodel’s stand out features that distinguishes them from many of their competitors and is a large contributing factor to their continued success is their generous delivery window. The Yodel drivers are out delivering parcels from 7am to 9pm at night, a 14 hour delivery window which is yet to me matched by their rivals. When sending a parcel, the customer can specify a specific delivery time to suit the recipient, which Yodel’s drivers will try their hardest to meet or get close to, to save any unnecessary waiting around. MyYodel is a separate official site from Yodel that’s specific purpose is to assist clients, customers and recipients with tracking packages they have sent via the delivery service, as well as those they are anticipating delivery of. Once on the site, it is also possible to manage the package and arrange re-deliveries. To track a parcel, all the customer needs to do is enter their personal reference code along with the postcode of the address to which the package has been delivered. MyYodel will then bring up detailed information as to its whereabouts, for example the precise date and time it was passed over to the courier for delivery, its current location and details of any previous delivery attempts. Customers will usually be directed to MyYodel via a ‘Sorry we missed you’ card left at their address when delivery has been attempted but nobody was there to sign for the package. Using the number on the card, redelivery or collection of the package can be arranged with Yodel’s drivers. If an orange card is left, this can be arranged on the MyYodel site, however if a green card is left, the recipient must call the number of the driver left on the card. Yodel are constantly growing and obtaining more big clients by the day, which means they are often recruiting and job opportunities within the company are rife, some of which could lead to more secure, long term careers. The innovative company thrives on having a quick thinking, technologically savvy workforce that are bubbling with ambition and always striving for betterment of themselves and the company, and it is these kinds of enterprising go-getters that they are searching for to fill the many positions available. There are many different behind the scenes teams that make up the Yodel brand and who are responsible for the smooth running of all its operations and deliveries, and the varied skill sets required for each role means there are opportunities to be had for a vast array of talented, dedicated workers, qualified graduates and bright minds. The Human Resources team at Yodel are perhaps the most integral part of the company as a whole, and as such it is one of the most challenging and testing roles available, though also the most rewarding. With 10,000 staff and 10 different sites dotted around the UK, there is never a dull moment in the life of member of the Yodel HR staff who must work tirelessly each day to make sure that everyone is fully trained and that motivation is running high at all times, enabling the company to maintain their status as parcel delivery leaders. The IT technicians at Yodel are responsible for coming up with innovative technological ideas, keeping the company fresh and up to date with the ever advancing world of computer technology and the non-stop developing world wide web. Ahead of the game technology that meets the desires and constantly changing needs of businesses and clients is one of the primary things that keeps people coming back to Yodel, so roles within IT are highly important, and with a strong team of creative techs that are buzzing with ideas, working in the department is always exciting. Getting Yodel’s name out there and ensuring that the brand is visible by the public and potential business clients is the main job of the Yodel PR and Marketing team, and it is one of the many departments that comes with lengthy career and promotion opportunities. Other integral Yodel teams which have jobs and potential careers available are the sales team, support services and finance team, as well as administration, customer experience, operations management, drivers, service centre roles and general operation. The most commonly advertised position is that of the neighbourhood courier. Many neighbourhood couriers are technically self-employed, with the purpose of the role being that it is highly flexible, with staff being able to take charge of their own hours and work around their every day commitments, e.g. child care. Using their own vehicle with the support of Yodel’s economical and fuel saving routing software to help them, neighbourhood couriers deliver packages within their local area, Monday to Saturday, at times that are convenient to them that fit in with Yodel’s large delivery window of 7am – 9pm. Specific jobs that are currently being advertised can be found by searching on the careers section of the Yodel website, where interested parties can narrow down their search according to salary, department and location, or even search for a particular job title if there is something specific they have in mind. Salaries at the company start at £10,000, with the top management positions receiving over £70,000 a year. Location options include the Midlands, North East, North West, Northern Ireland, Scotland, the South East and South West. There are several ways through which people can get in touch with Yodel, whether for general customer services enquiries, to get more information on how businesses can become clients of the company, or to simply send feedback or complaints about the service they have provided. Their customer service number is 0844 453 7443. To submit a client interest enquiry form or to send some feedback, go to the Contact Us page on their website and click on the relevant topic to be taken straight to a form which you can fill in and submit online. Yodel’s customer service centre is open from Monday to Friday 8am – 9pm, and Saturday 9am – 1pm. Please can you re-deliver my parcel ref 47705493. Please can you leave behind the side garden gate. I have received two parcels in the last two weeks. On both occasions the deliverer broke into my back garden and has damaged my gate. How do I speak to a human being? I returned from shopping to find a card saying my parcel couldn’t be delivered, there was no name on the card just a date! I called the number on the card gave the reference for it to be redelivered to be informed I had exceeded the limit – this was the fordt card I had through the door! I was then told I could collect it – so I agree to that then the automated message tells me the opening times then the address is blank then says do you want me to repeat to which the same thing happens! Then it says we have a contact number of x can you confirm this is the best number to contact you on! Its a number I have never heard of! So I call the number to see if they live down my road as maybe the card has been put through the wrong door! She lives in the area but not down my road – so now I am unsure if this parcel is even for me and if it is where the hell am I meant to collect it from! Absolute joke I have just wasted 45 minutes of my time all because your driver is too lazy to write a name on the card and because your automated message isn’t working correctly! Can someone contact me ASAP to sort this mess out Thanks! CAN YOU PLEASE GIVE ME ADDRESS SO I COLLECT MY PARCELL. let me know what time it may be delivered and i’ll wait in. You tried to deliver my parcel 3 times and I was not in. The first time you tried was at 13:34 hours, the second time was at 13:20 hours, and the third time was at 12:07 hours. Do you not think that it might have been advisable to vary the times a bit more so to increase the likelihood of me being in? Surely that is just common sense. There were no details on the card as to the whereabouts of your local depot so I had to call and deal with your automated telephone system, to which the machine spoke the post code so unclearly I had to find the details out myself. I now have a 24 Kilometre cycle ride to get my package. Why didn’t you leave my package at my local post office which is 4 doors away. Would I use/recommend your company!!! I think you know the answer. Shockingly bad service: received a delivery card today: no indication of where my parcel I bought and paid postage for is, no driver ID or contact number, no depo contact number or address, when I googled Yodel Reading it gave me an Irish phone number and address, no indication whether they will try redelivering nor to whom…to cap it all their website it said my tracking number was wrong !!!! How on earth do I get my parcel ?? No change or improvement form the last time my seller sent me something using Yodel.. They’ve nothing to Yodel about !…. Will definitely be complaining to Yodel and my seller. Hi. Today, I am returning to the house I found two messages that the arrival of two parcels. Post on both the packages are behind, but I found only one. The resulting package is 710711917183. So far I am completely unimpressed by Yodel. The package I was expecting by 11 December was eventually ‘delivered’ after the 24 December. A card left through my door gives no information at all about what they did with it and no number to contact. When I phoned the Yodel number on the card,I was told my address number was incorrect and was told I would be put through to a ‘human’.Whereupon a pre-recorded message said ‘all lines are closed’ and I was cut off. Roll on tomorrow to try and trace my parcel. I am not impressed. Hi im trying to track my parcel and its saying theres an error can you help me please. Sure, could you please give us your tracking number? Can you confirm this will be delivered today while people are in the office? originally 3 attempts were made to deliver the parcel. I was in hospital. The card said the parcel was at the dpot and I would have to collec or rearrange delivery. I decided to collect. When I got to the Team Valley depot, I was told the parcel was out for delivery again. A wasted journey!!!! When the courier came I was at hospital again. The undated card said the parcel had been left at no 23 Lancaster House. Subsequently a message was pushed through my door saying that person had given my parcel to no 24 Lancaster House. going to chase round all these different flats hunting for the parcel, when it SHOULD HAVE BEEN DELIVERED TO ME. As far as I a concerned I have to officially register that I have not received the parcel. It is up to you now to retrieve it and make the correct delivery TO ME and nobody else. We understand you are upset, but we are not part of Yedel and their drivers are deciding whether they deliver to a neighbour or not. It seem to work in most cases, but in your case it is totally a mess and they should help you out there. Could you call Yodel directly to solve this matter? We simply provide free tracking services.